I received the mentioned products in exchange for an honest review. The thoughts contained within this post are mine and may vary from the opinions of others. At Krafty Chix we specialize in handmade items for everyday chix! Combining krafty with trendy is what we are about! Everyone who reads the blog knows that I am about as southern as they come. I knew as soon as I saw the website Krafty Chix that I could take one of everything and totally make it mine. We monogram EVERYTHING around here. 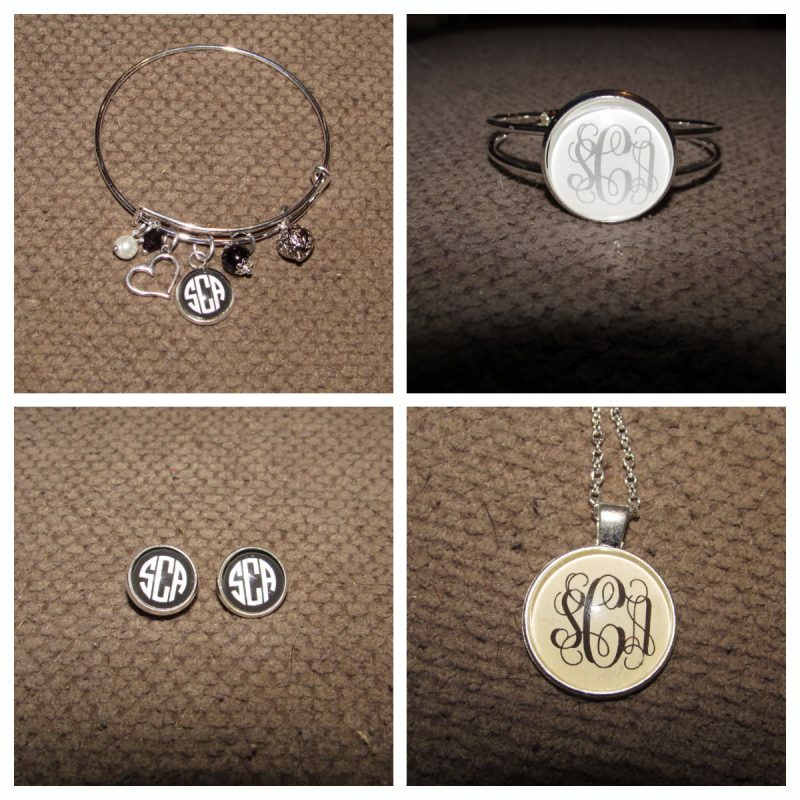 Babies come into the world usually with at least one monogrammed item and the older generation leaves with a jewelry box full of monogrammed items. When cleaning out things after my Grandma passed away we found plenty of monogrammed pieces, and while of course usually no one can use them they are special to hold on to. Krafty Chix brought memories back to me and in conversations with them via email I was able to express my love for all things monogrammed. Several weeks ago a package came to my doorstep. It was a Saturday, the West Virginia game was coming on and we were ready to cheer on the Mountaineers. As anyone knows who is a fan, on Saturdays we wear blue and gold and everyone gets into the game including my 2 boys. I completely lost my mind when this package came and totally lost track of the game. Here are the bags and hat that I received. I fell in love immediately because I knew the weekend bag was heading right on vacation with us in a few short weeks from its arrival. It is made from high quality materials and even has metal pieces on the bottom so I am not sitting the bag directly on the ground. 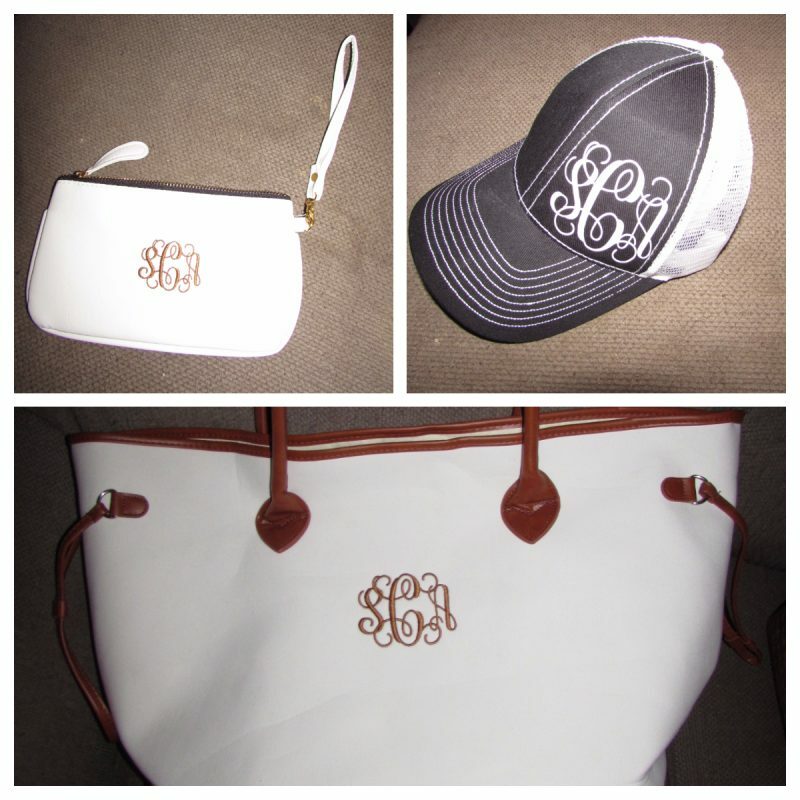 The wristlet is beautiful and the monogramming matches the weekender. I used this on vacation as well so that I didn’t have to carry a bulky purse everywhere we went. The compliments that I got on it were nothing short of amazing. I love when things I carry are noticed, especially when they are review items and I can talk about the company in person to people. The hat is just simply adorable. It helped me hide a very bad hair day while on our trip. It was easy to size and since I forgot not only my blow dryer but my hair straightener, this was nothing short of a blessing. Here are some jewelry pieces that I received. I admit that I haven’t worn all 4 yet but I did wear the cuff bracelet and the necklace. These pieces remind me of vintage jewelry and are totally my classic style. I love that each piece of jewelry that I got was silver (without asking the company) because that is my absolute favorite. I love timeless jewelry and these 2 pieces are definitely right up my alley. I also love that I can change the necklace to different size chains if I want to because it is a pendant style. 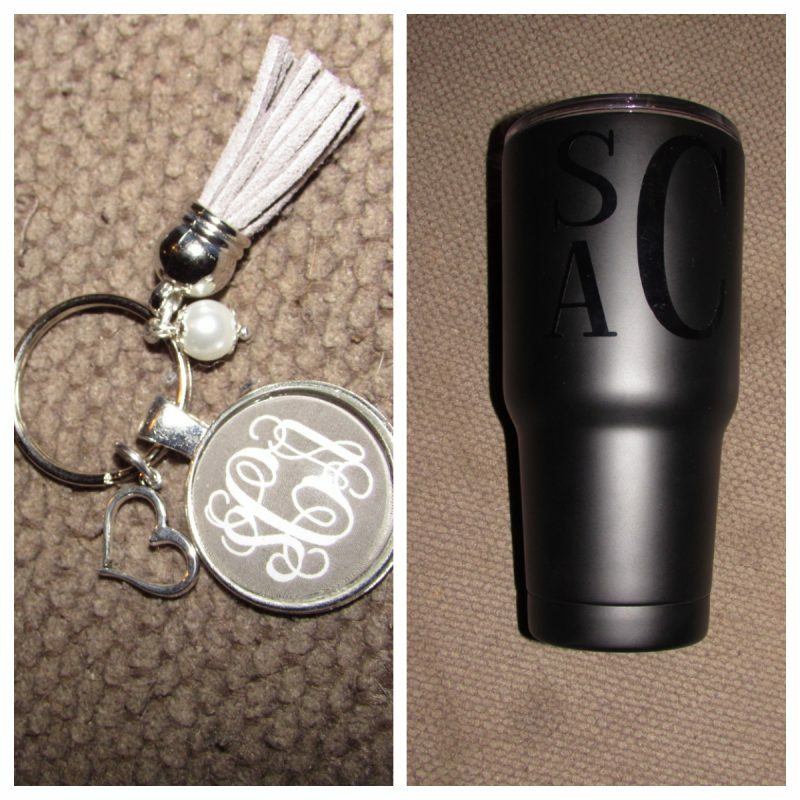 Last but absolutely not least, I received this adorable monogrammed key chain and tumbler drinking cup. Everyone has been obsessed with these cups that hold ice forever and this one passed the test. It also came on vacation so that I could have a drink whenever I wanted one (don’t worry y’all it was just Dr Pepper) and not have to worry about it being iced down or being too hot. I LOVE the black on black monogrammed design. The key chain is perfect for the few keys that I keep with me and I also found in a little gift shop some circle keepsakes that people are adding to key chains with names of their family. I was able to find both boys and my husband, so I am adding my own little flair to it. Of course it is perfect the way it is, but what the heck, lets personalize it some more! So what do you guys think? Isn’t Krafty Chix AMAZING?!?! I am in love with absolutely everything that arrived for review and feel like I customized this order myself even though it was all a surprise. I can’t imagine the amazing things that I can create and will be ordering in the coming months especially with the holidays coming up. So, with that being said, Krafty Chix is now a part of our 2017 Holiday Gift Guide here at Product Review Cafe because they literally have something for every woman in my life, and yours too! Did you order anything from Krafty Chix in the last month or so? Have you had any trouble from them? I ordered something on 11/27 and never received it. They gladly took my money though. They don’t respond to emails and there’s no way to contact them over facebook. According to other peoples posts on facebook, the BBB has been inundated with complaints. I am SO sorry to hear this Stacey! I see they have an email address info @ kraftychix.com I am highly upset for you and others who have not received products that you have paid for from this company and hope that it all gets resolved soon. We try to represent only the best companies and I know that sometimes things slip through the cracks, but that shouldn’t happen over and over. Please keep us posted on what happens. On 11/26 I ordered from Krafty Chix a personalized gift for a dear friend, confident that I would get it in time to ship for Christmas as their site promised a 7-10 business-days-to-ship time. 14 days later, I still haven’t received my item or a notification of shipment and reach out to the company for an update. I had to send 2 inquiries through their site and a Facebook message to get a response, which was that my order is set to ship that day, 16-business days later and that I would not receive it until end of day on 12/21. This is over double the wait time that they promise their customers. There is no chance I will get it for Christmas and there was no attempt from this company to proactively notify a customer of the delay during this time of year in particular where timeliness is so important. Incredibly disappointed with the service from this company. I am so sorry to hear of your experiences with Krafty Chix. At the time that our review was published we had nothing but good things to say about this company but unfortunately these days we get a lot of messages just like yours. I leave the review up because at the time it was our honest experience, but I am thinking at this time I may update the review to note the comments of my readers. We no longer work with this company because I like to only represent the best when writing reviews here.